Previous studies have shown a significant increase in tear protein peaks in the tears of diabetic patients suffering from dry eye. The aim of this study was to analyze the tear protein patterns from patients with diabetes mellitus who do not suffer from ocular surface diseases (DIA). A total of 515 patients were examined in this study (255 healthy subjects (controls) and 260 patients suffering from diabetes mellitus). Tear proteins were separated by sodium-dodecyl-sulfate polyacrylamide gel electrophoresis. After digital image analysis densitometric data files were created and subsequently used for multivariate statistical procedures. A significant increase in the number of peaks was detected in diabetic patients compared to controls (P < 0.0003). The analysis of discriminance revealed a highly significant discrimination between diabetic patients and controls (Wilks lambda: 0.27; P < 0.000001). 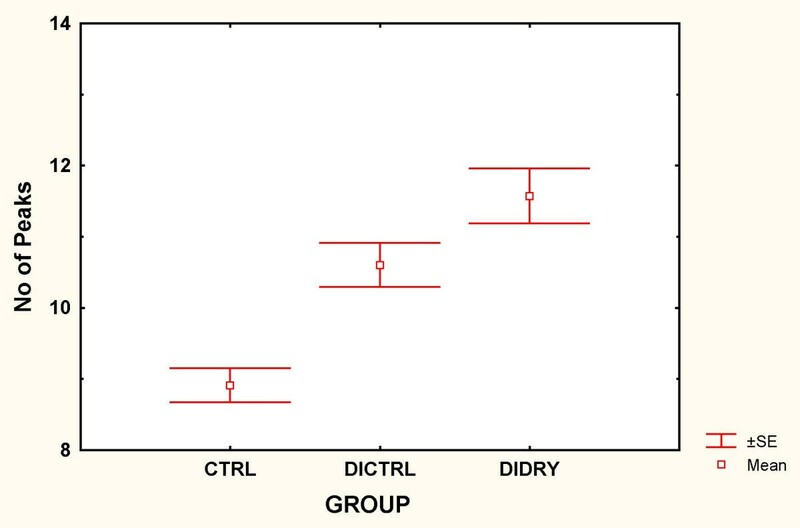 Furthermore, a significant difference in the protein pattern of diabetic patients could be detected between those suffering from dry eye or not (P < 0.002). The changes in protein patterns of diabetic patients increased with the duration of the diabetic disease. In diabetic patients with a disease duration longer than 10 years the changes were significantly more expressed than in patients with a shorter diabetic history (P < 0.003) and in healthy subjects (P < 0.0001). The tear protein patterns of diabetic patients are very different in the number and intensity of spots from those of healthy subjects. Furthermore, it could be demonstrated that the differences found in the tear patterns of diabetic patients are not equal to those found in previous studies in patients suffering from dry-eye disease. The alterations in the diabetic tears were correlated with the duration of the diabetic disease. With longer disease, history changes in the tear protein patterns increased. With the course of the disease some protein peaks appeared that are not present in healthy persons. Our study shows that the analysis of electrophoretic tear protein patterns is a new non-invasive approach in the early diagnosis and analysis of the pathogenesis of diabetes induced ocular surface disease. In previous studies changes in tear protein patterns of diabetic patients suffering from dry-eye disease could be found [1–3]. The occurrence of the dry eye disease and other ocular surface diseases is increased in diabetic patients . The dry eye syndrome has a very high frequency of occurrence in the industrial word. In the United States, 1 of 5 people, i.e. 59 millions of patients, suffer from symptoms of this disease (Eagle Vision, Yankelovich und Partners, 1997), and the number of dry eye patients has been doubled since the last ten years [5–8]. Dry eye patients typically suffer from discomfort, burning, irritation, photophobia, blurred vision, and have an increased risk of corneal infection and resulting irreversible tissue damages [9, 10]. This is mostly caused by aqueous, mucin or lipid deficiencies in tears. Until today, no causative treatment of the disease is available. Patients are symptomatically treated with lubricant eye drops. Worldwide about 100 millions of people suffer from Diabetes mellitus . Diabetes is a systemic disease with multiple severe very known related disorders such as the diabetic angiopathy, polyneuropathy, and nephropathy. Many ocular complications such as the inflammation of lids, acute orbital infections, cataract, and the diabetic retinopathy are known to be associated with diabetes mellitus and many of them may lead to blindness. Moreover, the risk of cataract is 2–4 times greater than in healthy people [12–15]. In diabetic patients a significantly increased corneal thickness  and a decreased corneal sensitivity [17–20] was demonstrated. Interestingly, the severity of the dry eye disease correlates with the severity of the diabetic retinopathy , which represents a main reason for blindness in diabetic patients. The tear film quantity (Schirmer test=basal secretory test, BST) is decreased in diabetic patients . In this study, we attempt to investigate the changes in the composition of tears in diabetic patients compared to healthy subjects. Tears of 515 patients were collected without touching the lid margins and eye lashes of the patients, 255 control persons (controls) and 260 diabetic patients (DIA). Informed consent was obtained from all patients participating in this study. All diabetic patients were diabetic type II with a known diabetic history. The tear volume of approximately 5 μl was sampled with a 5 μl glass capillary and stored at -80°C until use. The basis secretory test (BST) was performed and the patient's history was taken. Each patient was asked for his subjective symptoms like burning, itching, foreign body sensation, dryness, and photophobia. For all diabetic patients, it was determined if they suffer from dry-eye disease. The initial clinical diagnosis of dry eye was based on the BST value. Patients with values BST < 11/5' were classified as dry eye (DIDRY= diabetic patients suffering from dry eye; DICTRL= diabetic patients without dry eye symptoms). Tear samples were centrifuged at 12000 g for 3 to 5 min. 0.5 μl of each tear sample were diluted with 2.5 μl sample buffer (62.5 mM Tris, pH 6.8, 5% (v/v) 2-mercaptoethanol, 10% (w/v) saccharose, 2% SDS, 0.005 % bromphenolblue). The tear proteins were separated by SDS-PAGE (sodium-dodecyl-sulfate polyacrylamide gel-electrophoresis) on discontinuous slab-gels (, stacking gel: 125 mM Tris, pH 6.8, 0.1 % (w/v) SDS; separating gel: 375 mM Tris, pH 8.8, 0.1 % SDS, electrode buffer: 192 mM glycine, 25 mM Tris, pH 8.3, 0.1% SDS (MultiGel-Long, Biometra, Germany). Molecular weights were estimated using marker proteins (BioRad, Munich, Germany, molecular weight standards "broad range"). The electrophoretic separations were stained by the standard Coomassie-Blue procedure . The data was acquired using the video documentation system BioDocAnalyze (Biometra, Göttingen, Germany). All lanes were defined by start, end, and their width. For each particular Rf-region (relative mobility), a gray value was calculated by averaging the values within that width of the lane. For each electrophoretic lane, a densitometric data file was created by showing the gray-intensity values versus the Rf values. BioDocAnalyze evaluates height, area, and molecular weight, Rf value (relative mobility), etc., for all peaks in all lanes. The separated proteins could be identified by comparing the relative mobilities of unknown proteins of a sample to the relative mobilities of known proteins in the molecular weight standard (Broad Range, BioRad, Munich). For each electrophoretic lane a data vector was created and the Rf range, i.e., Rf = 0 through Rf = 1, was divided into 70 different classes. Every variable of the data vector thus represents 1/70 of the complete Rf-range. For all peaks of each electrophoretic lane it was calculated into which particular Rf-class this peak falls. The volume of that peak was added to the corresponding variable of this Rf-class in the data vector of this electrophoretic lane. From these data vectors, a multivariate analysis of discriminance was performed. This analysis of discriminance not only tests the zero hypothesis that mean data vectors of the different groups derive from a multivariate normally distributed population, but also shows which of the various groups are statistically different. Based on this, discriminant function analysis can be used to determine which variables (Rf ranges) caused the mean value comparison to become significant or which variables can discriminate between groups. Additionally, the analysis allows classification of electrophoretic patterns; it can be used to test whether an individual protein pattern is similar to the pattern of a particular known group or to which of several group patterns it shows the greatest similarity. This calculation procedure has been described in detail elsewhere [25, 26]. The statistical calculations were performed by STATISTICA™ (Ver 5.5, Statsoft, Tulsa, USA). There were no age- or gender-related statistical differences between patients with diabetes and control subjects. In the electrophoretic separations, the known main protein peaks could be detected (Fig. 1). The quantitative analysis of the volume of the 5 main protein peaks (lactoferrin, sIgA, albumin, lipocalin, and lysozyme) revealed no statistical significant difference between the clinical groups (healthy persons and patients suffering from diabetes mellitus; p > 0.05). Densitograph and photograph of an electrophoretic lane of the DRY group. Scanner units are plotted vs. the Rf-values (relative mobility). 1: lactoferrin and sIgA (secretory IgA), 2: albumin, 3: heavy chain of sIgA, 4: alpha sIgA, 5: lipocalin, formerly called tear specific prae albumin (TSPA), and 6: lysozyme. However, a significant increase in the number of peaks could be detected in diabetic patients compared to controls (P < 0.0003; Fig. 2). Mean number of peaks (± SE) in the tears of diabetic patients (DICTRL), diabetic patients suffering from dry-eye disease (DIDRY), and healthy volunteers (CTRL). The number of peaks was significantly higher in DIA, and DIDRY compared to CTRL (P < 0.05). A complete electrophoretic pattern analysis was performed – represented by the data vector derived from the densitographic data. The multivariate analysis of discriminance revealed a highly significant discrimination between diabetic patients and controls (Wilks lambda: 0.27; P < 0.000001). For each diabetic patient, a BST was performed. According to the results of this test, 140 of the diabetic patients suffered from dry-eye (DIDRY) and 120 of them did not (DICTRL). The protein patterns of DIDRY and DICTRL were compared and a significant difference in the protein pattern and number of peaks of diabetic patients could be detected between those suffering from dry eye disease or not (P < 0.002). To investigate the correlation between the changes in protein patterns and the duration of the diabetic disease, the diabetic patients were subgrouped between those, who had a known diabetic history longer than 10 years (DIA2) or shorter (DIA1). The changes in the protein patterns of diabetic patients increased with the duration of the diabetic disease. In diabetic patients with a disease duration longer than 10 years the alterations in protein patterns were significantly more expressed than in patients with a shorter diabetic history (P < 0.003). Furthermore, the changes were more pronounced in DIA2 compared to healthy subjects (P < 0.0001) (Fig. 3). A correlation analysis (spearman rank correlation test) revealed a r2-value of 0.9 (p < 0.03). The mean canonical roots (± SE) derived from the analysis of discriminance of tear protein patterns were plotted for three groups: normal controls, diabetic patients with a disease duration longer than ten years (DIA2) and shorter (DIA1). The figure illustrates the power of discriminance between the groups: the closer the bars are to each other, the more similar are the tear protein patterns of the electrophoretic separations of these groups. In previous studies a significant difference in the tear protein patterns of patients suffering from dry eye, diabetic patients suffering from dry eye, and healthy volunteers could be demonstrated . This was done by means of one-dimensional electrophoretical separations of the tear proteins. In the present study, the electrophoretic patterns from tear proteins of non-diabetic and diabetic patients were analyzed and compared to controls. 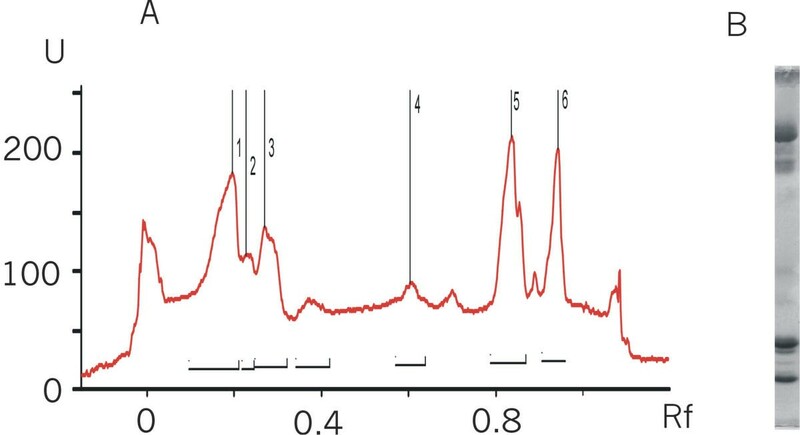 The main protein peaks, lactoferrin, lysozyme, lipocalin, and albumin were detected and quantified. No statistical significant difference between the main protein peaks of the groups could be found. However, the number of peaks was significantly increased in the tear protein pattern of diabetics. By including all peaks of the electrophoretic separations in the comparison, the multivariate approach could demonstrate a significant difference between both groups (diabetics and healthy volunteers). Thus, this must be due to changes in tear protein patterns, e.g. the development of new protein peaks, not only by slight differences between the concentrations of the main protein peaks. The most important differences in protein patterns were found in the molecular weight range of 30–50 kDa. We could not identify one single peak that was consistent in all patients. However, an increase of peaks in that molecular weight range was highly specific. Those "new" proteins, which do not exist in healthy subjects, could play a role in the pathogenesis of the diabetic disease and/or the development of eye-related complications of the diabetic disease. The present study demonstrates that changes in protein patterns are strongly correlated with the duration of the diabetic disease. The longer the disease duration, the more changes were expressed. Thus, it is promising to evaluate the use of these proteins as early-onset or follow-up marker of the diabetic disease. Further study has to prove if the differences in tear proteins found in this study have a prognostic value for the development of diabetic retinopathy. The differences found might not be caused by the diabetes itself, but by the trophic or autonomic disturbances common to that condition. However, an increased knowledge about the protein changes found in this study could be helpful, e.g., for identifying diabetics at risk of becoming blind. It is still not clear why diabetic patients develop dry eyes more often than healthy subjects . One possible explanation could be an exocrine dysfunction of the main lacrimal gland in patients with diabetes mellitus or perhaps the development of additional unknown proteins in the tear fluids. Another cause could be the reduction of stimulatory signals from the ocular surface to the lacrimal gland as consequence of the reduced corneal sensation and the influence on regulatory systems. However, this study could prove that the tear protein patterns of diabetics are different from those diabetic patients who suffer additionally from the dry-eye disease. These changes were clearly distinguishable from each other. Thus, it can be excluded that the method used to determine the changes in protein pattern just recognizes in general any changes as significant. In this study, the tear composition of diabetics was found to be changed in comparison to other diabetic patients suffering additionally from an ocular surface disease that is already known to have an influence on the protein patterns in tears [2, 3]. This preliminary study could clearly and surprisingly demonstrate that there are marked alterations in the diabetic tear protein patterns. Further studies will evaluate whether the changes in the tear protein patterns of the diabetic patients can be used as a new non-invasive diagnostic tool. Furthermore, identifying these proteins could contribute to learn more about the pathogenesis of diabetic related ocular surface disease. PS carried out the biochemical procedures. FHG conceived of the study and was responsible for the study design and computer analysis. BHD, AJA, and NP was involved in study design, discussion of the results and work with patients included in that study.